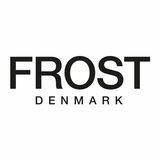 PURE DANISH DESIGN FROST: A WORK IN PROGRESS Our vision and focus is to provide a broad platform of architectural elements that both inspire and provide comprehensive design and application solutions. Our Danish culture of progressive contemporary design is conveyed through our products in a manner that blends design with function, creativity with solutions. FROST embraces the concept that Form is nothing without Function. Emphasis has also been placed on material, quality, and service. 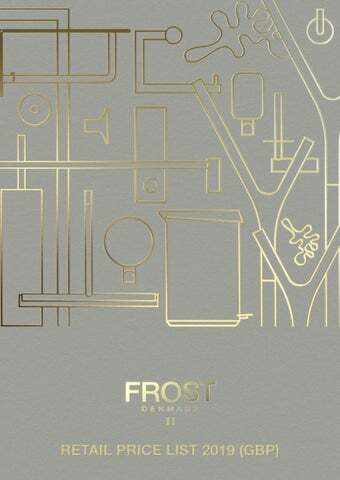 FROST has been the recipient of International Design Awards and we have realized that our company is a Work In Progress. This we attribute to the ongoing dialogue with architects worldwide that have been embraced as part of our company culture. FROST is more than a company: it is a vision, and a quest for excellence. Pedal bins are vital in modern interior design, and a highly visible feature in every bathroom, kitchen and office. Our lifestyle requires high standards of hygiene and functionality, and if you add ‘elegant design’ to the equation, the answer is: The FROST Pedal Bin. Asking Bønnelycke mdd to design the new pedal bin and include it in the deep FROST product range was an obvious step for us to take. The FROST Pedal Bin has strong roots in Danish design traditions, encapsulating the spirit of our time, and at the same time, it blends perfectly into any contemporary interior. The FROST Pedal Bin is your possibility to choose excellence. PEDAL BIN PEDAL BIN 250 small Stainless steel Height: 253mm Diameter: Ø230mm Projection: 300mm Weight: 4,3 kg. PEDAL BIN 250 small Stainless steel Height: 253mm Diameter: Ø230mm Projection: 300mm Weight: 4,3 kg. PEDAL BIN 350 medium Stainless steel Height: 363mm Diameter: Ø230mm Projection: 300mm Weight: 5 kg. PEDAL BIN PEDAL BIN 550 large Stainless steel Height: 539mm Diameter: Ø230mm Projection: 300mm Weight: 7 kg. PEDAL BIN 550 large Stainless steel Height: 539mm Diameter: Ø230mm Projection: 300mm Weight: 7 kg. Stainless steel Diameter: Ø28/100mm Height: 100mm Weight: 0,5 kg. CANDLESTICK 2002 tealight, single f/Ø40mm tealights Stainless steel Diameter: Ø44/74mm Height: 51mm Weight: 0,2 kg. CANDLESTICK 2003 single f/Ø22mm candles Stainless steel Diameter: Ø44/74mm Height: 51mm Weight: 0,2 kg. LIVING CANDLESTICK 2005 double f/Ø40mm candles Stainless steel Diameter: Ø44mm Length: 165mm Height: 51mm Weight: 0,5 kg. Stainless steel Diameter: Ø50/Ø92mm Height: 151mm Weight: 0,3 kg. Stainless steel Diameter: Ø92mm Height: 26mm Weight: 0,1 kg. Stainless steel Diameter: Ø171mm Height: 21mm Weight: 0,25 kg. Aluminum Length: 307mm Width: 220mm Height: 30mm Weight: 1 kg. Aluminum Length: 505mm Width: 345mm Height: 45mm Weight: 1 kg. Stainless steel Diameter: 120mm Height: 325mm Weight: 0,5 kg. TRIVET 1 w/round pattern Stainless steel Height: 7mm Width: 150mm Projection: 150mm Weight: 0,2 kg. TRIVET 2 w/square pattern Stainless steel Height: 7mm Width: 150mm Projection: 150mm Weight: 0,2 kg. Stainless steel Diameter: Ø55/95mm Height: 185mm Weight: 0,75 kg. Diameter: Ø16mm Projection: 28mm Weight: 0,2 kg. LULU Ø80 hook Stainless steel Diameter: Ø80mm Projection: 50mm Weight: 0,25 kg. BLOSSOM METAL hook Stainless steel Diameter: Ø55mm Projection: 65mm Weight: 0,15 kg. LIVING MIRROR 4120 round, w/hook Stainless steel Diameter: 120mm Height: 160mm Projection: 38mm Weight: 0,2 kg. MIRROR 4122 f/table Stainless steel Height: 210mm Width: 100mm Projection: 125mm Weight: 0,2 kg. MINI CAMOUFLAGE keyring Stainless steel Length: 60mm Height: 47mm Projection: 2,5mm Weight: 0,1 kg. Aluminum/stainless steel Height: 150mm Width: 600mm Projection: 300mm Weight: 6,5 kg. Aluminum/stainless steel Height: 150mm Width: 1000mm Projection: 300mm Weight: 11 kg. Aluminum/stainless steel Height: 150mm Width: 600mm Projection: 150mm Weight: 2,5 kg. Aluminium Height: 150mm Width: 600mm Projection: 150mm Weight: 2,5 kg. Height: 197mm Length: 460mm Width: 40mm Weight: 0,65 kg. Height: 197mm Length: 460mm Width: 40mm Weight: 2 kg. MIRROR 4120 round, w/hook Stainless teel Diameter: 120mm Height: 160mm Projection: 38mm Weight: 0,2 kg. MIRROR 4122 f/table Stainless teel Height: 210mm Width: 100mm Projection: 125mm Weight: 0,2 kg. UNU MIRROR 4127 w/frame Steel Height: 500mm Width: 600mm Projection: 110mm Weight: 12,5 kg. MIRROR 4128 w/frame Steel Height: 900mm Width: 600mm Projection: 110mm Weight: 18 kg. MIRROR 4132 m/frame Steel Width: 400mm Height: 400mm Projection: 70mm Weight: 5,5 kg. MIRROR 4133 m/frame Steel Width: 400mm Height: 600mm Projection: 70mm Weight: 7 kg. Aluminum Length: 250mm Width: 250mm Height: 372mm Weight: 5 kg. UNU SHELF 4021 600mm Aluminum Height: 150mm Projection: 150mm Length: 600mm Thickness: 4mm Weight: 3,2 kg. UNU SHELF 4036 600mm Aluminum Height: 150mm Projection: 450mm Length: 600mm Thickness: 4mm Weight: 7,5 kg. UNU SHOE/MAGAZIN SHELF 4045 300mm Aluminum Height: 150/250mm Projection: 285mm Length: 300mm Thickness: 4mm Weight: 5 kg. UNU SHELF 4026 1000mm Aluminum Height: 250mm projection: 150mm Length: 1000mm Thickness: 4mm Weight: 5 kg. UNU SHELF 4030 1000mm Aluminum Height: 350mm Projection: 150mm Length: 1000mm Thickness: 4mm Weight: 7,9 kg. BLIND PLATE 4040 600mm Aluminum Height: 350mm Length: 600mm Thickness: 4mm Weight: 3,4 kg. UNU BLIND PLATE 4041 1000mm Aluminum Height: 350mm Length: 1000mm Thickness: 4mm Weight: 5 kg. Aluminum Height: 12mm Diameter: Ø50mm Weight: 0,2 kg. Steel/stainless steel Width: 628mm Height: 1500mm Projection: 300mm Weight: 14 kg. Steel/stainless steel Width: 1028mm Height: 1500mm Projection: 300mm Weight: 17 kg. BUKTO CLOTHES STAND 6004 600mm with castors Steel/stainless steel Width: 638mm Height: 1560mm Projection: 450mm Weight: 15 kg. CLOTHES STAND 6004 600mm with castors Steel/stainless steel Width: 638mm Height: 1560mm Projection: 450mm Weight: 15 kg. BOTTOM PLATE f/U6004 and U6002 Steel Length: 568mm Width: 380mm Height: 8mm Weight: 1 kg. CLOTHES STAND 6005 1000mm with castors Steel/stainless steel Width: 1038mm Height: 1560mm Projection: 450mm Weight: 18 kg. BUKTO CLOTHES STAND 6005 1000mm with castors Steel/stainless steel Width: 1038mm Height: 1560mm Projection: 450mm Weight: 18 kg. BOTTOM PLATE f/U6005, U6003 and U6010 Steel Length: 968mm Width: 380mm Height: 8mm Weight: 1,5 kg. CLOTHES STAND 6010 1000mm with castors and wardrobe shelf Steel/stainless steel Height: 1575mm Width: 1038mm Projection: 450mm Weight: 26 kg. Plastic Height: 1058mm Width: 300mm Weight: 5 kg. BUKTO EXTENSION 20CM f/bukto clothes stand (2 pcs./set) Steel Height: 200mm Weight: 0,3 kg. Stainless steel Diameter: Ø30/25mm Width: 90mm Projection: 60mm Weight: 0,4 kg. Steel/stainless steel Length: 628mm Width: 300mm Height: 700mm Weight: 5 kg. Stainless steel Width: 30mm Projection: 84mm Weight: 0,1 kg. Steel/stainless steel Width: 580mm Height: 1515mm Weight: 7 kg. Steel/aluminum Height: 825mm Width: 638mm Projection: 450mm Weight: 22 kg. BUKTO SHELF 6061 1038mm bend f/shelf stand 6060 Aluminum Height: 80mm Width: 1038mm Projection: 450mm Thickness: 3mm Weight: 6 kg. Aluminum Diameter: Ø475mm Height: 450mm Weight: 12 kg. Aluminum Diameter: Ø475mm Height: 650mm Weight: 13 kg. NOVA2 Kitchen, bathroom & wardrobe accessories. Consistent details such as the shadow edge between the mounting surface, and the product compliments the discreet and complete series. All elements are interpretations of the meeting between the stringent form, and the cylindrical form - this is quite apparent on the hooks for the system. The products are made from stainless steel 304 and designed by BĂ¸nnelycke mdd, who, with a refined sense of simplicity, technical details and stylish fit, has managed to combine aesthetics and function in one and create a range of quality products that will adorn any home. The NOVA2 series is available in the six FROST finishes: Universal Brushed, Perfect Polished, Original Copper, Modern Gold, Classic Black and Pure White. The NOVA2 series is designed by BĂ¸nnelycke mdd. HOOK 6L (2 pcs./set) Stainless steel Diameter: Ø25mm Projection: 50mm Weight: 0,45 kg. Stainless steel Length: 222mm Projection: 52mm Weight: 0,6 kg. Stainless steel Length: 406mm Projection: 52mm Weight: 1 kg. WARDROBE/KITCHEN RAIL 2 Stainless steel CC: 1000mm Diameter: Ø14mm Length: 1028mm Projection: 40mm Weight: 1,7 kg. WARDROBE/KITCHEN RAIL extension 1000mm Stainless steel Diameter: Ø14mm Length: 1000mm Projection: 40mm Weight: 1,7 kg. NOVA2 WARDROBE SHELF 1 600mm Stainless steel CC: 600mm Width: 625mm Height: 115mm Projection: 300mm Weight: 3,5 kg. Stainless steel Diameter: Ø300/360mm Height: 1700mm Weight: 13,5 kg. HALL STAND 2 f/wall mounting Stainless steel Diameter: Ø100mm Height: 1700mm Projection: 350mm Weight: 6,5 kg. NOVA2 HALL STAND 3 swivel Stainless steel CC: 1000mm Height: 1028mm Projection: 100/158mm Weight: 4,5 kg. COAT RACK 1 200mm, swivel Stainless steel CC: 200mm Height: 228mm Projection: 40/100mm Weight: 0,4 kg. COAT RACK 2 150mm, swivel Stainless steel CC: 150mm Height: 178mm Projection: 40/150mm Weight: 0,3 kg. COAT RACK 3 100mm, swivel Stainless steel CC: 100mm Height: 128mm Projection: 40/170mm Weight: 0,2 kg. Stainless steel Length: 145mm Height: 111mm Projection: 40mm Weight: 0,4 kg. TOILET ROLL HOLDER 2 spare toilet roll holder Stainless steel Height: 167,5mm Projection: 118,5mm Weight: 0,9 kg. TOILET BRUSH 9 f/floor Stainless steel Height: 365mm Diameter: Ø70mm Weight: 1,5 kg. NOVA2 TOILET BRUSH 1 f/floor Stainless steel Diameter: Ø89mm Height: 415mm Projection: 127,5mm Weight: 2,5 kg. TOILET BRUSH 2 f/wall mounting Stainless steel Diameter: Ø89mm Height: 415mm Projection: 114mm Weight: 3 kg. Stainless steel Diameter: Ø89/200mm Height: 714,5mm Weight: 6,1 kg. SOAP DISPENSER 3 f/wall 200ml Stainless steel Diameter: Ø63mm Height: 196mm Projection: 100mm Weight: 1 kg. MADAM CLAMP f/wall mounting Stainless steel Projection: 350mm Height: 30mm Weight: 0,6 kg. PAPER BIN 30 liter Stainless steel Width: 300mm Height: 400mm Projection: 150mm Weight: 7 kg. LID 1944 f/paper dispenser Stainless steel Width: 1,5mm Height: 295mm Projection: 107mm Weight: 0,4 kg. NOVA2 LID 1945 f/paper bin Stainless steel Width: 1,5mm Height: 295mm Projection: 147mm Weight: 0,6 kg. TISSUE DISPENSER f/wall and table Stainless steel Height: 72mm Width: 248mm Depth: 124mm Weight: 0,3 kg. NOVA2 TOILET ROLL HOLDER 7 f/arm support Stainless steel Diameter: Ø14mm Height: 128/84mm Length: 163mm Weight: 0,4 kg. COVER f/arm support (2 pcs./set) Stainless steel Diameter: Ø42mm Projection: 42mm Weight: 1 kg. NOVA2 BATH GRIP 300mm Stainless steel CC: 300mm Diameter: Ø16mm Length: 328mm Projection: 62mm Weight: 0,8 kg. TOWEL BAR 3 single, 600mm Stainless steel CC: 600mm Diameter: Ø14mm Length: 628mm Projection: 72mm Weight: 1 kg. NOVA2 TOWEL BAR 8 double, 800mm Stainless steel CC: 800mm Diameter: Ø14mm Length: 828mm Projection: 122mm Weigt: 2 kg. Stainless steel Width: 200mm Height: 48mm Projection: 120mm Weight: 1 kg. Stainless steel Width: 360mm Height: 48mm Projection: 120mm Weight: 1,5 kg. Stainless steel Width: 277mm Projection: 145mm Weight: 0,3 kg. NOVA2 SHOWER SHELF 6 double, f/glass door Stainless steel Width: 250mm Height: 700mm Projection: 168mm Weight: 1 kg. SHOWER SHELF 2 f/corner Stainless steel Width: 200mm Height: 48mm Projection: 120mm Weight: 1 kg. NOVA2 SHOWER SHELF 3 f/corner Stainless steel Width: 180mm Height: 48mm Projection: 180mm Weight: 1 kg. MAGNIFYING MIRROR f/wall (x5) Stainless steel Diameter: Ø168mm Height: 215mm Width: 247mm Projection: 40mm Weight: 1 kg. Stainless steel Diameter: Ø168mm Height: 286mm Weight: 1 kg. Diameter: Ø28/33mm Length: 75mm Weight: 0,45 kg. Height: 36mm Length: 55mm Projection: 28mm Weight: 0,25 kg. Height: 25mm Length: 60mm Projection: 25mm Weight: 0,2 kg. SHELF BRACKET 3 (2 pcs./set) Aluminum Width: 14mm Height: 22,5mm Projection: 120mm Weight: 0,2 kg. SHELF BRACKET 4 (2 pcs./set) Aluminum Width: 14mm Height: 22,5mm Projection: 200mm Weight: 0,45 kg. QUADRA HOOK 8 (2 pcs./set) Stainless steel Width: 14mm Height: 36mm Projection: 22,5mm Weight: 0,15 kg. HOOK 8L (2 pcs./set) Stainless steel Width: 22,5mm Height: 36mm Projection: 36mm Weight: 0,2 kg. QUADRA TOWEL BAR 6 double, 600mm Stainless steel CC: 600mm Diameter: Ø12mm Height: 36mm Projection: 105mm Length: 615mm Weight: 1 kg. Stainless steel Length: 145mm Height: 100mm Projection: 36mm Weight: 0,45 kg. TOILET ROLL HOLDER 4 spare toilet roll holder Stainless steel Height: 160mm Projection: 120mm Weight: 0,45 kg. Stainless steel Diameter: Ø89mm Height: 365mm Weight: 2 kg. QUADRA TOILET BRUSH 4 round f/wall Stainless steel Diameter: Ø89mm Height: 365mm Projection: 114mm Weight: 2,4 kg. TOILET BRUSH 6 square, f/floor Stainless steel Width: 90mm Projection: 90mm Height: 387mm Weight: 1,25 kg. TOILET BRUSH 7 square, f/wall Stainless steel Width: 90mm Projection: 115mm Height: 387mm Weight: 2,4 kg. QUADRA SOAP DISPENSER 5 square, f/table 200 ml Stainless steel Height: 185mm Width: 60x60mm Projection: 95mm Weight: 1,1 kg. Stainless steel Width: 375mm Projection: 105mm Height: 36mm Weight: 1,3 kg. QUADRA SHELF CLAMP 6 (2 pcs./set) f/10-30mm shelves Stainless steel Width: 24mm Projection: 80mm Weight: 0,7 kg. The SIGNATURE COLLECTION celebrates the individual. Each design stands out as a solo and may be used and enjoyed as such. Nevertheless they may also be combined to form larger individual combinations. Steel/stainless steel Diameter: Ø350mm Height: 1750mm Weight: 17 kg. Steel/aluminum Diameter: Ø450mm Height: 450mm Weight: 11 kg. Steel/aluminum Diameter: Ø450mm Height: 650mm Weight: 12 kg. WISHBONE TABLE 3 1030mm Steel/aluminum Diameter: Ø550mm Height: 1030mm Weight: 19 kg. LULU Ø60 hook Stainless steel Diameter: Ø60mm Projection: 35mm Weight: 0,2 kg. SIGNATURES CAMOUFLAGE hook, single Steel Del. w/65mm feet Length: 400mm Height: 240mm Projection: 67mm Weight: 2 kg. Steel Diameter: Ã&#x2DC;20mm Projection: 35/50/65mm Weight: 0,1 kg. Steel Length: 80mm Height: 58mm Projection: 23mm Weight: 0,1 kg. Steel Length: 80mm Height: 58mm Projection: 23mm Weight: 0,3 kg. RADA 600 shoe rack Steel/stainless steel Height: 120mm Width: 600mm Projection: 164mm Weight: 3 kg. SIGNATURES RADA 1000 shoe rack Steel/stainless steel Height: 120mm Width: 1000mm Projection: 164mm Weight: 5 kg. FLASH stool Aluminum Height: 475mm Width: 490mm Projection: 355mm Weight: 5 kg. Diameter: Ø55mm Projection: 65mm Weight: 0,15 kg. BLOSSOM PLATE f/hooks Steel Height: 150mm Width: 450mm Projection: 2mm Weight 0,25 kg. Diameter: Ø55mm Height: 104mm Projection: 89mm Weight: 0,3 kg. Aluminum Height: 800mm Width: 600mm Projection: 120mm Weight: 12 kg. Stainless steel/black silicone Diameter: Ø8mm Width: 460mm Weight: 0,4 kg. Stainless steel Diameter: Ø8mm Width: 460mm Weight: 0,35 kg. Stainless steel Diameter: Ø16mm Width: 460mm Weight: 0,45 kg. HANGER 3 'TURN'' turnable Stainless steel Diameter: Ø12mm Width: 460mm Weight: 0,6 kg. Stainless steel Thickness: 10x10mm Width: 460mm Weight: 0,4 kg. Stainless steel Thickness: 15x15mm Width: 460mm Weight: 0,4 kg. Stainless steel Thickness: 25x3mm Width: 460mm Weight: 0,35 kg. Nova is a comprehensive series of wardrobe products, sanitary hardware and bathroom fittings. The series is manufactured from satin or mirror polished stainless steel 304 to resist the aggressive environment in toilets and bathrooms. The simplicity and timeless design is based on form follows function. Nova can be combined in countless variations, which allow the individual user to create an individual style in all building types. Stainless steel Diameter: Ø16mm Projection: 65mm Weight: 0,1 kg. Stainless steel Width: 141mm Height: 88mm Projection: 40mm Weight: 0,4 kg. BACK PLATE f/toilet roll holder 5 Stainless steel Height: 50mm Width: 140mm Projection: 1,5mm Weight: 0,1 kg. TOWEL BAR 9 single, 600mm Stainless steel CC: 600mm Diameter: Ø12mm Length: 618mm Projection: 53mm Weight: 1 kg. TOWEL BAR 10 double, 600mm Stainless steel CC: 600mm Diameter: Ø12mm Length: 618mm Projection: 119mm Weight: 1,8 kg. TOILET BRUSH 5 f/wall, 96mm Stainless steel CC: 96mm Width: 111mm Height: 390mm Projection: 103mm Weight: 1,3 kg. CUP HOLDER w/porcelain cup Stainless steel/pocelain Width: 100,5mm Height: 90,5mm Projection: 87mm Weight: 0,8 kg. SHELF w/shelf clamps Glass/stainless steel Width: 600mm Height: 10/25mm Projection: 126mm Weight: 2,5 kg. CORNER SHELF w/shelf clamps Glass/stainless steel Width: 176mm Height: 10/Ø25mm Projection: 176mm Weight: 1,1 kg. Stainless steel Diameter: Ø16/45mm Projection: 218mm Weight: 0,3 kg. Stainless steel Diameter: Ø10/45mm Projection: 47mm Weight: 0,2 kg. HOOK 5 X 2 Stainless steel Diameter: Ø25mm Length: 222mm Height: 40mm Projection: 32mm Weight: 0,3 kg. HOOK 5 X 4 Stainless steel Diameter: Ø25mm Length: 406mm Height: 40mm Projection: 32mm Weight: 0,5 kg. Stainless steel Diameter: Ø16/30mm Height: 31mm Projection: 35mm Weight: 0,1 kg. Stainless steel Diameter: Ø20/30mm Height: 35mm Projection: 60mm Weight: 0,2 kg. Stainless steel CC: 450mm Height: 103mm Projection: 91mm Weight: 1,6 kg. Stainless steel CC: 380mm Height: 170mm Width: 440mm Projection: 105mm Weight: 1,3 kg. SHOE SHELF 1 600mm Stainless steel Height: 250mm Length: 619mm Projection: 300mm Weight: 3,6 kg. NOVA SHOE SHELF 1 600mm Stainless steel Height: 250mm Length: 619mm Projection: 300mm Weight: 3,6 kg. SHOE SHELF 2 1000mm Stainless steel Height: 250mm Length: 1019mm Projection: 300mm Weight: 5 kg. With the emphasis on versatile design, clean lines and endless combination possibilities, this concept creates a modern and yet timeless range of hardware such as lever handles, roses, window handles and door stops. The products are made from stainless steel 304. FROST Architectural Hardware offers architects and end-users a set of tools to help achieve perfection in the important details of a building or a home by providing the finishing touches and functionality needed in our modern world. Stainless steel Length: 112mm Projection: 60mm Rose: Ø50mm Weight: 0,9 kg. Stainless steel Length: 130mm Projection: 72mm Rose: Ø50mm Weight: 1 kg. Stainless steel Length: 130mm Projection: 74mm Rose: Ø50mm Weight: 1 kg. ARCHITECTURAL HARDWARE DOOR HANDLES HB103 ELEMENT 1010 Stainless steel Length: 120mm Projection: 62mm Rose: Ø50mm Weight: 0,5 kg. ELEMENT 1009 Stainless steel Length: 117mm Projection: 62mm Rose: Ø16mm Weight: 0,5 kg. ELEMENT 1001 Stainless steel Length: 120mm Projection: 59mm Rose: Ø50mm Weight: 0,45 kg. KUBE 1001 Stainless steel Length: 120mm Projection: 60mm Rose: 50x50mm Weight: 0,46 kg. TUBE 1051 Ø16mm Stainless steel Length: 120mm Projection: 59mm Rose: Ø50mm Weight: 0,1 kg. TUBE 1052 Ø19mm Stainless steel Length: 130mm Projection: 65mm Rose: Ø50mm Weight: 0,47 kg. ARCHITECTURAL HARDWARE DOOR HANDLES ELEMENT 1053 Ø16mm Stainless steel Length: 130mm Projection: 65mm Rose: Ø50mm Diameter: Ø16mm Weight: 0,41 kg. KUBE 1053 Ø16mm Stainless steel Length: 120mm Projection: 65mm Rose: 50x50mm Diameter: Ø16mm Weight: 0,45 kg. ELEMENT 1054 Ø19mm Stainless steel Length: 128mm Projection: 62mm Rose: Ø50mm Diameter: Ø19mm Weight: 0,5 kg. KUBE 1054 Ø19mm Stainless steel Length: 128mm Projection: 62mm Rose: 50x50mm Diameter: Ø19mm Weight: 0,5 kg. Stainless steel Rose: Ø50mm Projection: 26mm Weight: 0,25 kg. Stainless steel Rose: Ø50mm Projection: 26mm Weight: 0,24 kg. Stainless steel Rose: 50x50mm Projection: 26mm Weight: 0,24 kg. Stainless steel Projection: 26mm Rose: Ø50mm Weight: 0,21 kg. KUBE 3001 profile cylinder Stainless steel Projection: 4mm Rose: 50x50mm Weight: 0,11 kg. ELEMENT 3002 keyhole Stainless steel Projection: 4mm Rose: Ø50mm Weight: 0,1 kg. KUBE 3002 keyhole Stainless steel Projection: 4mm Rose: 50x50mm Weight: 0,1 kg. KUBE 3004 blind Stainless steel Projection: 4mm Rose: 50x50mm Vægt: 0,1 kg. ELEMENT 3005 assa keyhole Stainless steel Projection: 4mm Rose: Ø50mm Weight: 0,1 kg. KUBE 3005 assa keyhole Stainless steel Projection: 4mm Rose: 50x50mm Weight: 0,1 kg. KUBE 3006 kaba rose for door handle Stainless steel Projection: 4mm Rose: 50x50mm Weight: 0,1 kg. ARCHITECTURAL HARDWARE WINDOW HANDLES HB101 WINDOW right Stainless steel Length: 112mm Projection: 67mm Rose: 70x33mm Weight: 0,35 kg. HB101 WINDOW left Stainless steel Length: 112mm Projection: 67mm Rose: 70x33mm Weight: 0,35 kg. KUBE 4031 Stainless steel Length: 110mm Projection: 53mm Rose: 72x27mm Weight: 0,18 kg. Diameter: Ø28mm Length: 75mm Weight: 0,45 kg. Height: 20mm Width: 20mm Projection: 59x82mm Weight: 0,72 kg. Height: 25mm Diameter: Ø45mm Weight: 0,1 kg. Projection: 45/75mm Diameter: Ø25mm Weight: 0,1 kg. Stainless steel Projection: 5mm Height: 72mm Width: 27mm Weight: 0,1 kg. Stainless steel Projection: 5mm Height: 51mm Width: 51mm Weight. 0,25 kg. Furniture cabinet handles, knobs and complimentary components. Your choice of style in a selection of finishes will create an individual piece of furniture. All our Danish designed fittings with their sleek profiles will enhance quality furniture with lines of fusion and finish. HANDLES Not just any handle, it is a FROST handle. A FROST handle will raise a prosaic piece of furniture to a new height it will subtly enhance a wonderful piece of furniture, complimenting the design while maintaining the overall aesthetic. KNOBS Minimal perfection! An opportunity to enhance your door or draw with the right look. Many designs offer sophistication and elegance for contemporary and traditional furniture. DRAWER PULLS Cutting edge Danish designs for high tech furniture in kitchen, media storage and bathroom areas. SPECIALITY HARDWARE Design brackets and towel bars to match our quality handles. Functional elements for your interior design. HANDLES BARCELONA 32 right and left Zinc CC: 32mm Length: 75mm Height: 9mm Projection: 28mm Weight: 0,1 kg. BARCELONA 96 Zinc CC: 96mm Length: 150mm Height: 31mm Projection: 25mm Weight: 0,13 kg. BARCELONA 128 Zinc CC: 128mm Length: 180mm Height: 31mm Projection: 25mm Weight: 0,16 kg. BARCELONA 192 Zinc CC: 192mm Length: 276mm Height: 31mm Projection: 25mm Weight: 0,23 kg. Some handles have limited stock. Please ask for quantities. HANDLES SKYLINE 160 Zinc CC: 160mm Length: 230mm Height: 11mm Projection: 35mm Weight: 0,31 kg. SKYLINE 224 Zinc CC: 224mm Length: 294mm Height: 11mm Projection: 35mm Weight: 0,33 kg. WALL 64 Zinc CC: 64mm Length: 92mm Height: 9mm Projection: 28mm Weight: 0,08 kg. WALL 160 Zinc CC: 160mm Length: 230mm Height: 11mm Projection: 35mm Weight: 0,21 kg. HANDLES WALL 224 Zinc CC: 224mm Length: 294mm Height: 11mm Projection: 35mm Weight: 0,23 kg. TOWER 160 Zinc CC: 160mm Length: 230mm Height: 11mm Projection: 35mm Weight: 0,21 kg. QUADRA 32 Aluminum CC: 32mm Length: 46mm Height: 36mm Projection: 23mm Weight: 0,05 kg. HANDLES QUADRA 128 Aluminum CC: 128mm Length: 142mm Height: 36mm Projection: 23mm Weight: 0,14 kg. QUADRA 160 Aluminum CC: 160mm Length: 174mm Height: 36mm Projection: 23mm Weight: 0,20 kg. QUADRA 224 Aluminum CC: 224mm Length: 238mm Height: 36mm Projection: 23mm Weight: 0,23 kg. DETAIL 64 Aluminum CC: 64mm Length: 76mm Height: 10mm Projection: 34mm Weight: 0,05 kg. HANDLES DETAIL 128 Aluminum CC: 128mm Length: 140mm Height: 10mm Projection: 34mm Weight: 0,07 kg. DETAIL 224 Aluminum CC: 224mm Length: 236mm Height: 10mm Projection: 34mm Weight: 0,13 kg. ARKI+® 45 Aluminum CC: 32mm Length: 45mm Height: 9mm Projection: 28mm Weight: 0,1 kg. ARKI+® 74 Aluminum CC: 64mm Length: 74mm Height: 9mm Projection: 28mm Weight: 0,1 kg. HANDLES ARKI+速 74 REVERSE Aluminum CC: 16mm Length: 74mm Height: 9mm Projection: 28mm Weight: 0,1 kg. ARKI+速 160 Aluminum CC: 128mm Length: 160mm Height: 9mm Projection: 28mm Weight: 0,15 kg. ARKI+速 256 symmetrical Aluminum CC: 128/224mm Length: 256mm Height: 9mm Projection: 28mm Weight: 0,25 kg. HANDLES ARKI+速 448 symmetrical Aluminum CC: 128/416mm Length: 448mm Height: 9mm Projection: 28mm Weight: 0,35 kg. ARKI+速 256 asymmetrical Aluminum CC: 128+96mm Length: 256mm Height: 9mm Projection: 28mm Weight: 0,25 kg. HANDLES POOL 160 Zink CC: 160mm Length: 200mm Height: 11mm Projection: 29mm Weight: 0,2 kg. POOL 224 Zinc CC: 224mm Length: 264mm Height: 11mm Projection: 29mm Weight: 0,3 kg. POOL 320 Zinc CC: 320mm Length: 360mm Height: 11mm Projection: 29mm Weight: 0,4 kg. PARIS 64 Zinc CC: 64mm Length: 88mm Height: 11mm Projection: 25mm Weight: 0,07 kg. HANDLES PARIS 96 Zinc CC: 96mm Length: 120mm Height: 11mm Projection: 25mm Weight: 0,08 kg. PARIS 128 Zinc CC: 128mm Length: 160mm Height: 15mm Projection: 30mm Weight: 0,14 kg. PARIS 160 Zinc CC: 160mm Length: 192mm Height: 15mm Projection: 30mm Weight: 0,2 kg. PARIS 224 Zinc CC: 224mm Length: 256mm Height: 15mm Projection: 30mm Weight: 0,25 kg. HANDLES PARIS 320 Zinc CC: 320mm Length: 352mm Height: 15mm Projection: 30mm Weight: 0,3 kg. MOUNTAIN 128 Stainless steel CC: 128mm Length: 148mm Height: 10mm Projection: 38mm Weight: 0,17 kg. MOUNTAIN 160 Stainless steel CC: 160mm Length: 180mm Height: 10mm Projection: 38mm Weight: 0,19 kg. MOUNTAIN 224 Stainless steel CC: 224mm Length: 244mm Height: 10mm Projection: 38mm Weight: 0,22 kg. HANDLES MOUNTAIN 320 Stainless steel CC: 320mm Length: 340mm Height: 10mm Projection: 38mm Weight: 0,28 kg. MOUNTAIN 416 Stainless steel CC: 416mm Length: 436mm Height: 10mm Projection: 38mm Weight: 0,4 kg. OCEAN 128 Stainless steel CC: 128mm Length: 143mm Height: 15mm Projection: 38mm Weight: 0,12 kg. OCEAN 160 Stainless steel CC: 160mm Length: 175mm Height: 15mm Projection: 38mm Weight: 0,14 kg. HANDLES OCEAN 224 Stainless steel CC: 224mm Length: 239mm Height: 15mm Projection: 38mm Weight: 0,17 kg. PERTH 128 Aluminum CC: 128mm Length: 138mm Height: 10mm Projection: 30mm Weight: 0,14 kg. PERTH 160 Aluminum CC: 160mm Length: 170mm Height: 10mm Projection: 30mm Weight: 0,17 kg. PERTH 224 Aluminum CC: 224mm Length: 234mm Height: 10mm Projection: 30mm Weight: 0,22 kg. HANDLES PERTH 320 Aluminum CC:320mm Length: 330mm Height: 10mm Projection: 30mm Weight: 0,27 kg. PERTH 448 Aluminum CC: 448mm Length: 458mm Height: 10mm Projection: 30mm Weight: 0,39 kg. PERTH 512 Aluminum CC: 512mm Length: 522mm Height: 10mm Projection: 30mm Weight: 0,44 kg. DUNA 128 Aluminum CC: 128mm Length: 142mm Height: 7mm Projection: 35mm Weight: 0,1 kg. HANDLES DUNA 160 Aluminum CC: 160mm Length: 174mm Height: 7mm Projection: 35mm Weight: 0,15 kg. DUNA 224 Aluminum CC: 224mm Length: 238mm Height: 7mm Projection: 35mm Weight: 0,19 kg. BOSTON 128 Zinc CC: 128mm Length: 148mm Height: 12mm Projection: 31mm Weight: 0,13 kg. BOSTON 288 Zinc CC: 288mm Length: 308mm Height: 12mm Projection: 31mm Weight: 0,2 kg. HANDLES BEAT 128 Stainless steel CC: 128mm Length: 140mm Height: 12mm Projection: 36mm Weight: 0,09 kg. BEAT 160 Stainless steel CC: 160mm Length: 172mm Height: 12mm Projection: 36mm Weight: 0,1 kg. BEAT 224 Stainless steel CC: 224mm Length: 236mm Height: 12mm Projection: 36mm Weight: 0,13 kg. BEAT 320 Stainless steel CC: 320mm Length: 332mm Height: 12mm Projection: 36mm Weight: 0,3 kg. HANDLES FUNXION 128 Aluminum CC: 128mm Length: 138mm Height: 10mm Projection: 30mm Weight: 0,05 kg. FUNXION 224 Aluminum CC: 224mm Length: 234mm Height: 10mm Projection: 30mm Weight: 0,09 kg. UNIVERSE 128 Aluminum CC: 128mm Length: 135mm Height: 36mm Projection: 23mm Weight: 0,13 kg. SYDNEY 128 Zinc CC: 128mm Length: 155mm Height: 20mm Projection: 21mm Weight: 0,14 kg. HANDLES SYDNEY 160 Zinc CC: 160mm Length: 193mm Height: 22mm Projection: 34mm Weight: 0,2 kg. MONTANA Aluminum CC: 128mm Length: 204mm Height: 40mm Projection: 36mm Weight: 0,3 kg. MUST 64 Zinc CC: 64mm Length: 73mm Height: 23mm Projection: 17mm Weight: 0,04 kg. MUST 128 Zinc CC: 128mm Length: 137mm Height: 23mm Projection: 17mm Weight: 0,05 kg. HANDLES THEMA 32 Zinc CC: 32mm Length: 144mm Height: 40mm Projection: 28mm Weight: 0,21 kg. THEMA 160 Zinc CC: 160mm Length: 198mm Height: 40mm Projection: 28mm Weight: 0,24 kg. OPTIMA Zinc CC: 32mm Diameter: Ã&#x2DC;60mm Projection: 24mm Weight: 0,1 kg. Aluminum Diameter: Ø40mm Projection: 13mm Weight: 0,04 kg. Aluminum Diameter: Ø30mm Projection: 15mm Weight: 0,04 kg. FLOW Zinc CC: 16mm Width: 37mm Height: 25mm Projection: 22mm Weight: 0,06 kg. KNOBS LOTUS Zinc CC: 16mm Width: 45mm Height: 45mm Projection: 25mm Weight: 0,12 kg. Zinc or Stainless steel Width: 15mm Height: 15mm Projection: 25mm Weight: 0,04 kg. Zinc or Stainless steel Width: 25mm Height: 25mm Projection: 30mm Weight: 0,13 kg. Stainless steel Width: 50mm Height: 50mm Projection: 13mm Weight: 0,04 kg. Stainless steel Width: 102mm Height: 51mm Projection: 13mm Weight: 0,05 kg. Stainless steel Width: 140mm Height: 50mm Projection: 16mm Weight: 0,08 kg. Zinc Width: 172mm Height: 50mm Projection: 21mm Weight: 0,34 kg. Stainless steel Width: 120mm Height: 41mm Projection: 13mm Weight: 0,05 kg. Stainless steel Diameter: Ø60mm Projection: 15mm Weight: 0,01 kg. ZETA 16 Zinc CC: 16mm Width: 32mm Height: 15mm Projection: 35mm Weight: 0,02 kg. DRAWER PULLS ZETA 64 Zinc CC: 64mm Width: 96mm Height: 15mm Projection: 35mm Weight: 0,06 kg. ZETA 128 Zinc CC: 128mm Width: 160mm Height: 15mm Projection: 35mm Weight: 0,09 kg. Stainless steel Width: 25mm Height: 130mm Projection: 380/430mm Weight: 1 kg. Stainless steel Width: 25mm Height: 130mm Projection: 430/470mm Weight: 1 kg. Stainless steel Width: 25mm Height: 220mm Projection: 480mm Weight: 1,1 kg. TOWEL STAND T3 300/400 Aluminum Length: 300/400mm Height: 60mm Projection: 35mm Weight: 0,5 kg.